Here's another big label release that has left precious little biographical information behind it. Good luck finding out much about this short-lived early-1970s California-based quartet, let alone locating a decent review of their sole 1972 release. During high school drummer Fred Darling and guitarist Gary Stovall played together in the band Churchill Downs. After school the pair relocated from Idaho to Southern California and began to enjoy some late 1960s local success on the L.A. club circuit when Darling got his induction notice, bringing the band to an end. Completing his two years of active duty in the Army, in 1971 Darling returned to L.A. where Stovall invited him to join a band he'd just put together. Featuring Darling, Stovall, bassist Brad Palmer, and singer Kent Sprague, while not exactly ground breaking (but still rare in rock circles), the quartet's integrated line up and country-rock moves attracted the attention of Columbia Records which promptly signed them to a contract. 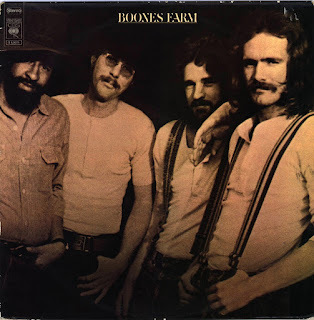 Produced by Jim Messina (of Loggins and Messina fame), 1972's cleverly-titled "Boones Farm" was clearly intended to appeal to the growing country-rock audience (just check out the cover photos that made the quartet look like they had just finished a cattle round up). 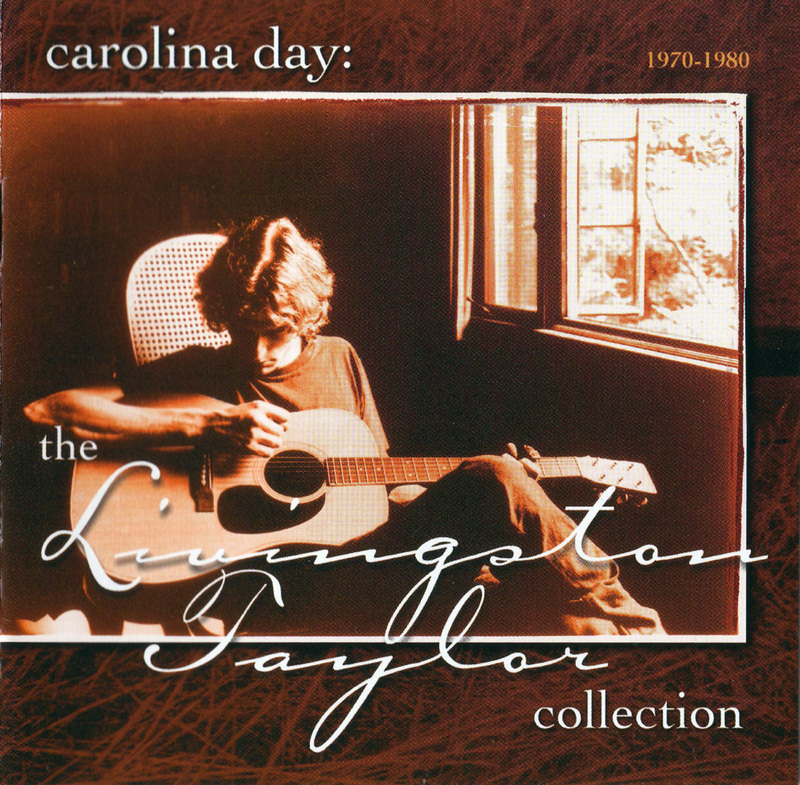 Largely written by Sprague and Stovall with the other two members contributing, tracks like the acoustic ballad 'She's So Good', 'The Me Nobody Knows', and 'If You Can't Be My Woman' had a distinctive country-rock edge, complete with acoustic arrangements and some nice Crosby, Stills, Nash & Young-styled four part harmonies (check out 'Love has a Mind of Its Own' for a taste of the comparison). That said, similar to era-competitors like The Buffalo Springfield, The Byrds, or Poco their roots were far more diverse and the collection included a healthy dose of conventional rock. 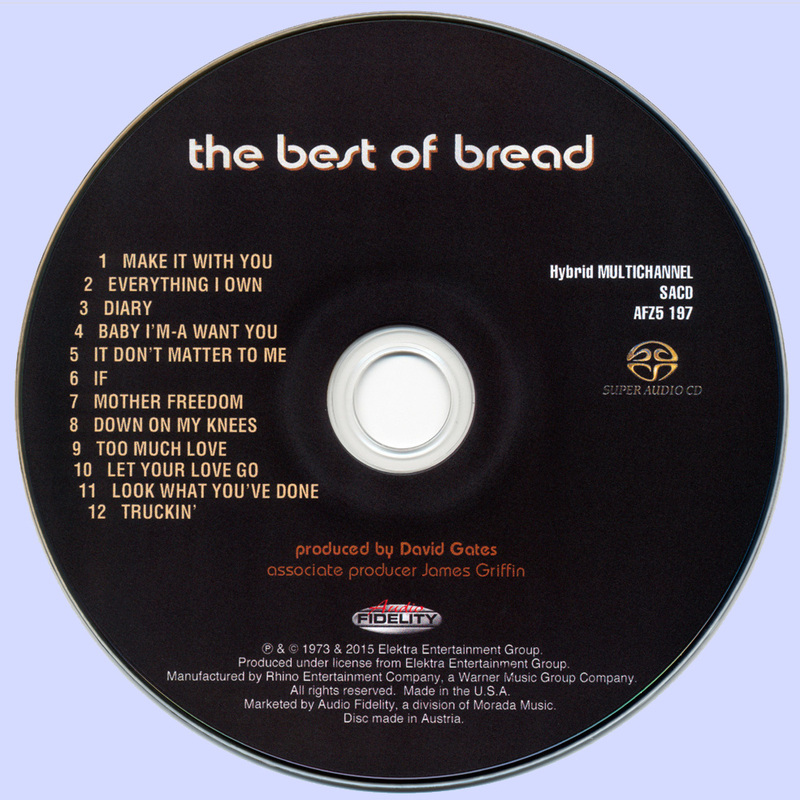 In fact, over half of the album was straight ahead rock. Powered by Sprague's deep, soulful voice, 'Good Old Feelin'', 'Play Children Play', 'Livin' Together', 'The Me Nobody Knows' and the blazing 'So Much Wrong' (with a killer Stovall guitar solo) were all first-rate, out-and-out rockers that would have sounded fine on FM radio.s you wonder how these talented guys fell through the cracks when so many far less talented outfits made it onto the charts ... Another one that sounds better the more I listen to it and you can still pick up on the cheap. Dixie Rock is a worthy successor and another excellent yet underrated entry in the band's catalog. 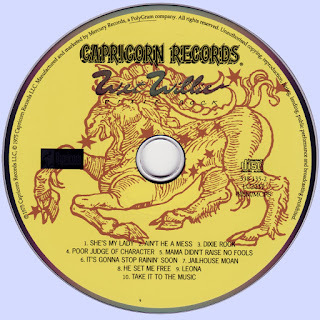 With their picture dominating the back cover, backing singers the Williettes (Ella Avery and Donna Hall) receive featured treatment, and their contribution adds substantial gospel flavor to the group's approach. Avery's duet with frontman Jimmy Hall on "Mama Don't Raise No Fools" is one of the disc's highlights, and the stripped-down version of Albert Brumly's "He Set Me Free" could have come directly off a traditional spiritual album. 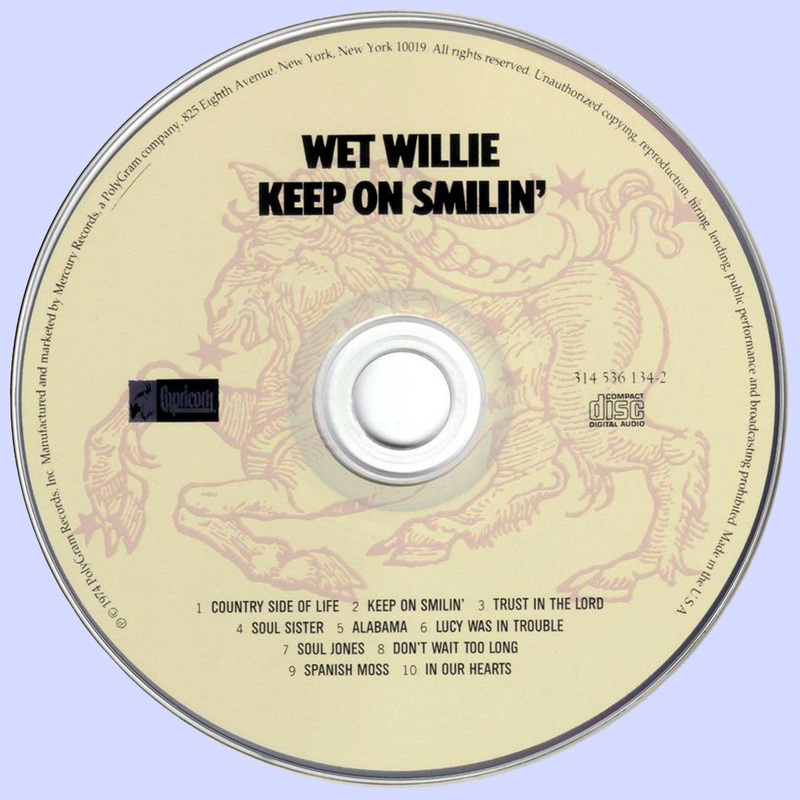 But "Leona" (a minor hit single), is pure greasy Southern singalong funk and rock that, along with the title cut, slots into Willie's established sound. The R&B-drenched "It's Gonna Stop Rainin' Soon," featuring sublime slide work from Ricky Hirsch and Jimmy Hall's mournful harp along with the deep Delta blues of "Jailhouse Moan," help make this one of the band's most cohesive works, although it takes a few spins for their charms to be appreciated. 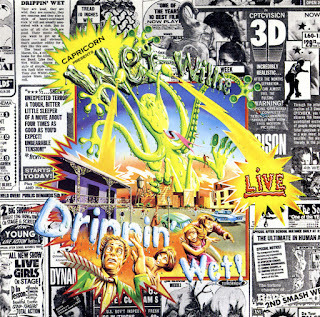 This is the album to start with on Wet Willie, and their real best-of, a surging, forceful concert recording of white Southern soul and blues-rock at its best. The band holds its own alongside outfits like the Allman Brothers -- no, this isn't the kind of history-making set that At Fillmore East by the latter band constituted, but it is a great show presenting this group and its members at their very best. 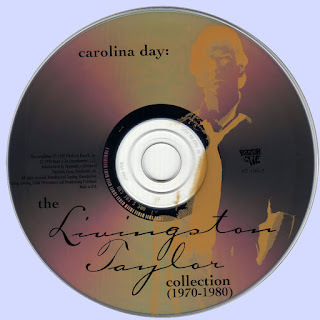 The playing is hard and muscular, the singing rich and expressive, and they have serious fun with numbers like "Red Hot Chicken" (stretched to ten minutes) and do a nice, laidback "Macon Hambone Blues," surrounded by crunchy renditions of pieces like "Airport." 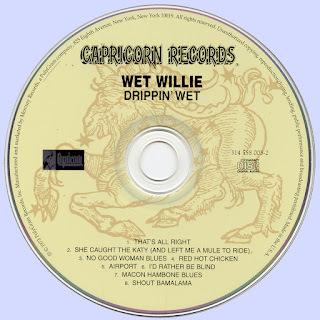 What's more, they switch effortlessly from a lean, guitar-centered blues-rock to a much funkier, sax-driven sound -- maybe it was that diversity that prevented Wet Willie from really breaking big outside of the Southeast. The vibes they were picking up from the audience on New Year's Eve at the Warehouse in New Orleans make this a compelling concert document. 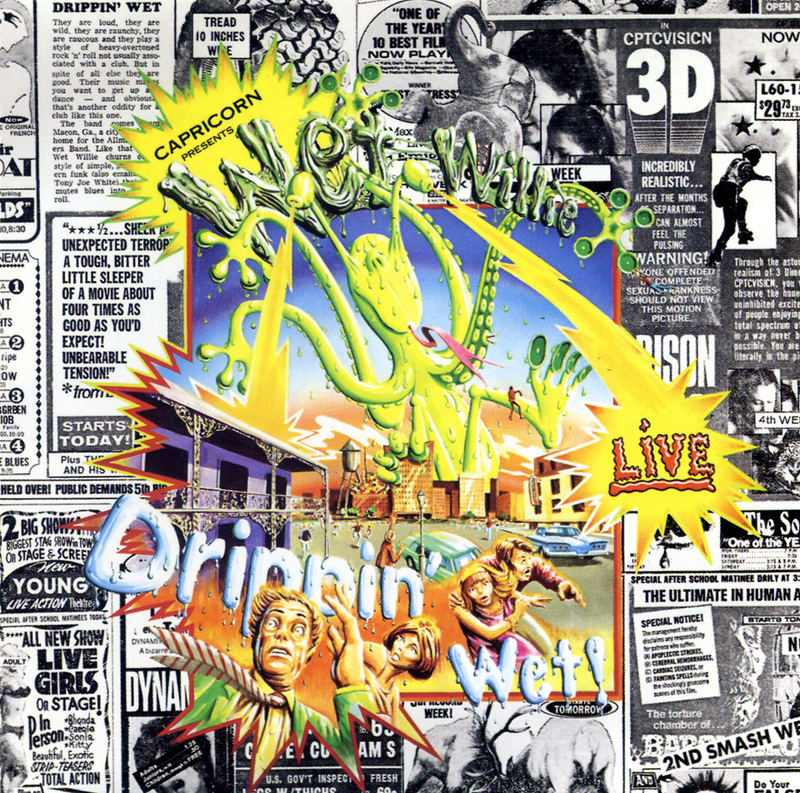 The five original members of Wet Willie, all from Mobile, Alabama, came together in 1969 and soon realized they had something special. Jimmy was out front, a triple threat on lead vocals, sax and harmonica; as one writer said, “Jimmy Hall was who Mick Jagger wanted to be!” Ricky Hirsch played guitars and wrote or co-wrote much of the band’s material, with Jack Hall, Jimmy’s brother, on bass, Lewis Ross on drums and John Anthony on keyboards. 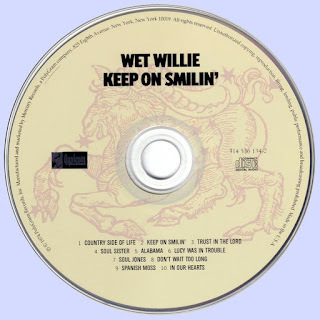 Keep on Smilin' is the definitive Wet Willie studio album, bluesier than a lot of their other work, and much of it also somewhat more laid-back. Beginning with "Country Side of Life," the band sounds tight, tuned, and in top form. Their playing is clean and crisp, and the vocals exude a bold confidence. 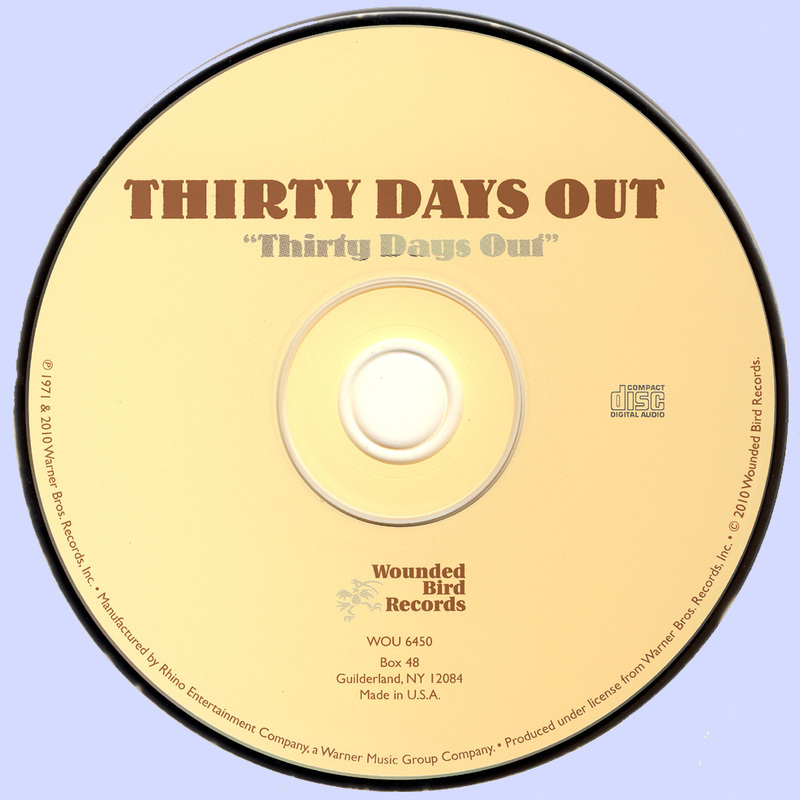 The hit title track is a compelling reggae-country meld that's one of the more interesting and long-wearing country-rock hits of its period. 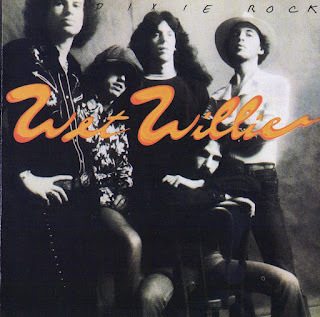 It's surrounded by gospel-flavored material and also one of the neater Stax-influenced tracks ever put down by a white band, "Soul Sister," which is also a great showcase for the Williettes. Other highlights include the acoustic country ballad "Alabama," a major change of pace for this band with some clever lyrical conceits; the ultra-funky "Soul Jones" (which manages to work in a quote from the Allman Brothers), and the soulful rocker "Lucy Was in Trouble," which became a key part of the group's concert sets. The 1998 Capricorn remastering has an especially full sound, improving significantly on the original LP. 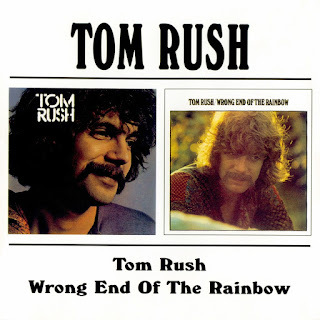 Second self-titled album, this time for CBS, finds Tom Rush continuing to mine the fertile vein of folk-rock songwriters the likes of James Taylor, Jackson Browne, and Canadian Murray McLaughlin. Standouts include David Wiffen's "Driving Wheel," McLaughlin's "Old Man's Song" and "Child's Song," and Browne's "Colors of the Sun." Also, there appears to be a hint of country sneaking into the arrangements. A very solid effort. Adding four original compositions to the mix helped Tom Rush gather even more acclaim with Wrong End of the Rainbow. But it was his covers of "Sweet Baby James" and Jesse Winchester's "Biloxi" that made listeners sigh. 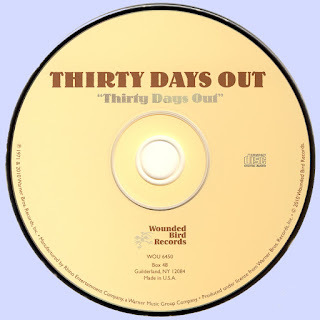 More country-rock than previous efforts, nothing here should be forsaken because all cuts merit listening. 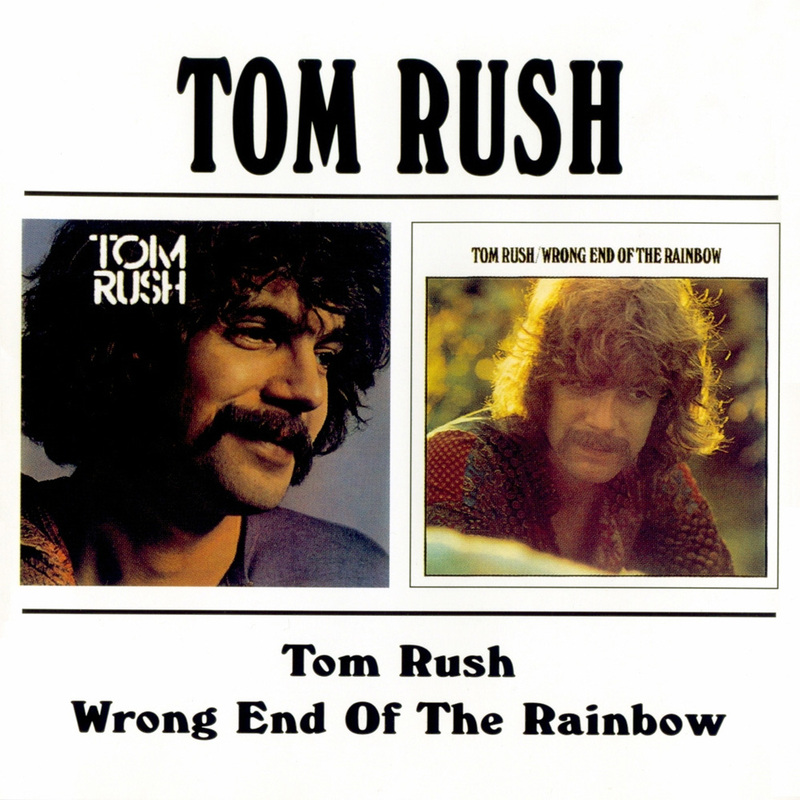 Again, Tom Rush found the right mix of material and released another solid effort. British Tour '76 is not an expanded version of the original Live album, despite the similarity in track listings, but a remarkable document of the band's next major tour, in support of the newly released SAHB Stories album. History relates that the group was on the way out now, and certainly its subsequent decline was precipitous. Here, however, Alex and the lads aren't simply firing on all cylinders -- they're enacting one of the finest shows any British stage had ever seen. Their seething reinvention of "Amos Moses," the bicentennial gift "Boston Tea Party," and the so-compulsive "Dance to Your Daddy" are the new album's contributions to the show; elsewhere, it's business as usual, as the SAHB dig back into their earliest fare for a mighty "Isabel Goudie" and the inevitable thunder of "Faith Healer"; "Tomahawk Kid," "Vambo," and the encore hit "Delilah" are all present and deliriously correct, but the highlight has to be "Framed," with Alex in full comic Hitler mode, and delivering a routine that you simply couldn't get away with today. That doesn't stop it from being hysterically funny, though, as well as serving as a potent reminder that good taste and great rock & roll have rarely been comfortable bedfellows. Hamilton, Ontario is a steel town. I guess you could compare it to Pittsburgh, although I've never been to Pittsburgh -- but the skyline is marked by foundries, their chimneys belching black smoke and the odd flame. A rust colored haze hangs in the sky, stratifying the horizon -- earth, air (somewhat breathable), smog and heaven. The Hamilton mountain provides the backdrop. Really it is an escarpment, but we call it the mountain, because we need to. It provides a layer of oxygen-producing trees needed in the overall picture. This is the kind of place that a hardy breed calls home. It is the perfect place for the blues. Blue collar blues, we know what that means. The city is a little bluer today--our own King of the Blues died last week. Not BB, or Albert, or Freddie--but a local boy. Richard Newell's blues ran as deep as his soul--his body finally couldn't take any more abuse, and gave up the ghost. 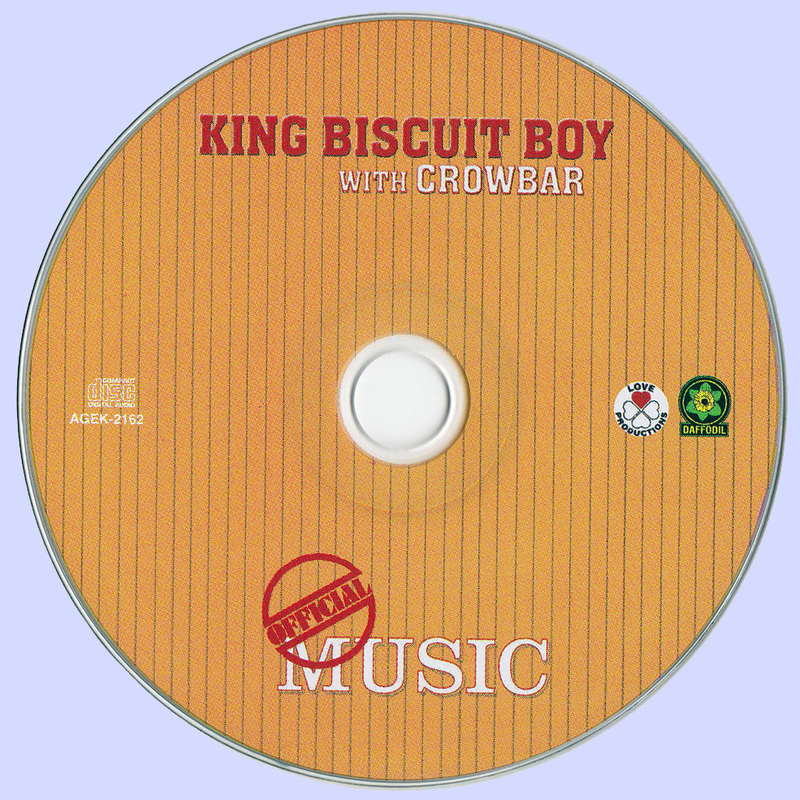 King Biscuit Boy is gone. But his music will never die! I've been listening to a lot of Biscuit over the past few days. 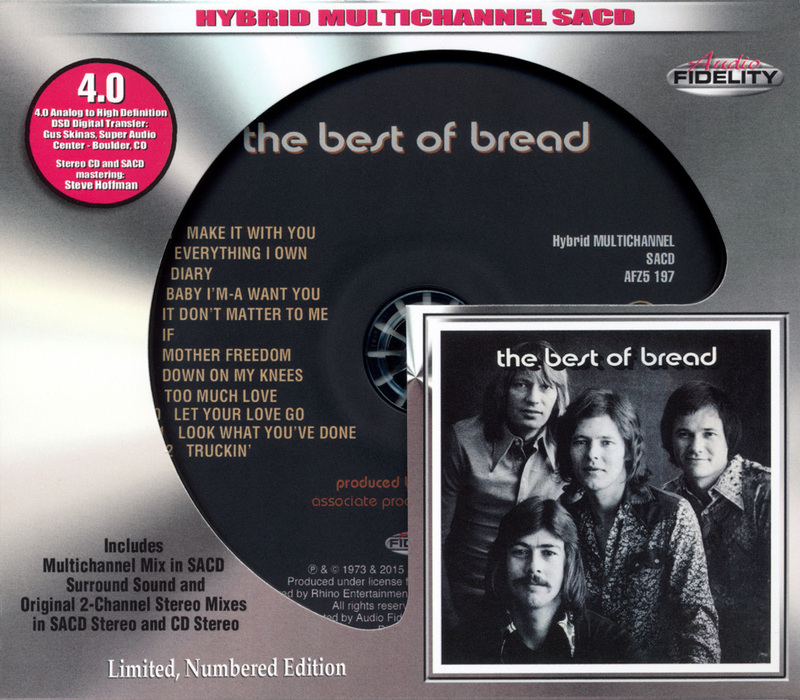 The first album I turned to was Badly Bent, his Best of collection which contains a perfect selection from his first three albums; but really you should listen to the original albums in their entirety to fully appreciate Newell's gifts. So when Stony Plain sent me the original albums on CD I quickly put on Official Music, the album he made with Crowbar in 1972. Crowbar had been the rag-tag bunch of musicians Ronnie Hawkins hired to replace his last band, the one that backed up Bob Dylan, and moved to the Big Pink house in Woodstock. These guys were raw, tough and raunchy, they could really play. 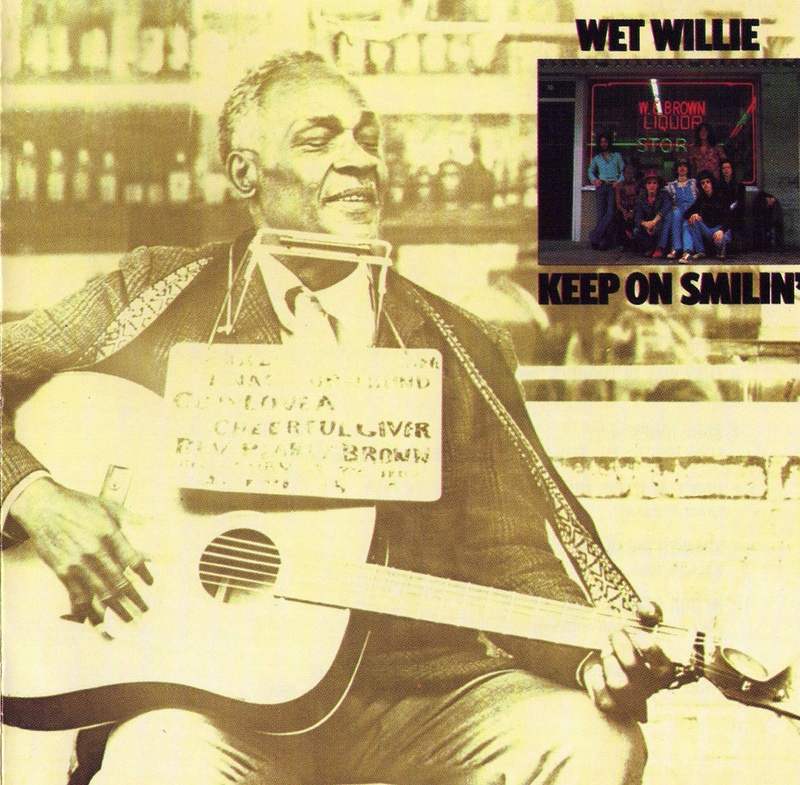 Newell adopted the King Biscuit Boy name-tag because he could play the harp to sound like Sonny Boy Williamson. He could blow that harp like anything. He made those reeds quiver. He made 'em sound like a saxophone, an orchestra, it was amazing. 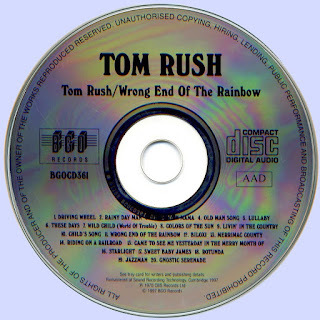 The music this raw band -- and the young blues shouter made, was "official" all right! The album begins with a screamer, "Highway 61." Twin guitars of Rheal Lanthier and John "the Ghetto" Gibbard and then Biscuit's high voice, a blend of Robert Johnson howl and Muddy Waters growl. This one rocks. There is no let up, though, as the second track; "Don't Go No Further," steams ahead, slower but still potent. Kelly Jay Fordham, Doug Riley and Rick Bell provide keyboards and the amazing Larry Atamanuik keeps the solid beat! Jazz musicians Moe Kauffman, Steve Riley and Greg Mudry form a powerful horn section. This is good stuff. 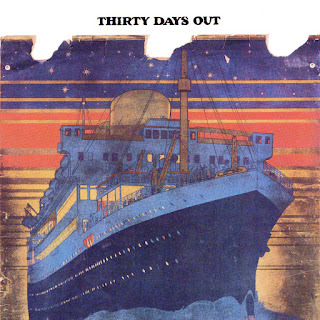 "Key to the Highway," "Corinna," "Hoy Hoy Hoy," "Shout Bama Lama," the covers are brilliantly chosen and well done. Newell also writes a couple...the long and humorous "Biscuit's Boogie," "Badly Bent," and "Cookin' Little Baby" show his understanding of the blues form. If this was his only album it would be a classic, but he would soon leave Crowbar and produce one of the greatest blues albums ever made. I was lucky enough to catch King Biscuit Boy and Crowbar in a bar one night. One of those places where the girls dance with the girls, and the guys order a pitcher of beer and sit there with their buddies listening to the band. They rocked the joint out. The walls were sweating! They had played together behind Hawkins, and they knew each other intimately, they played as one--Biscuit just came out to do a featured spot and then went back to the bar. 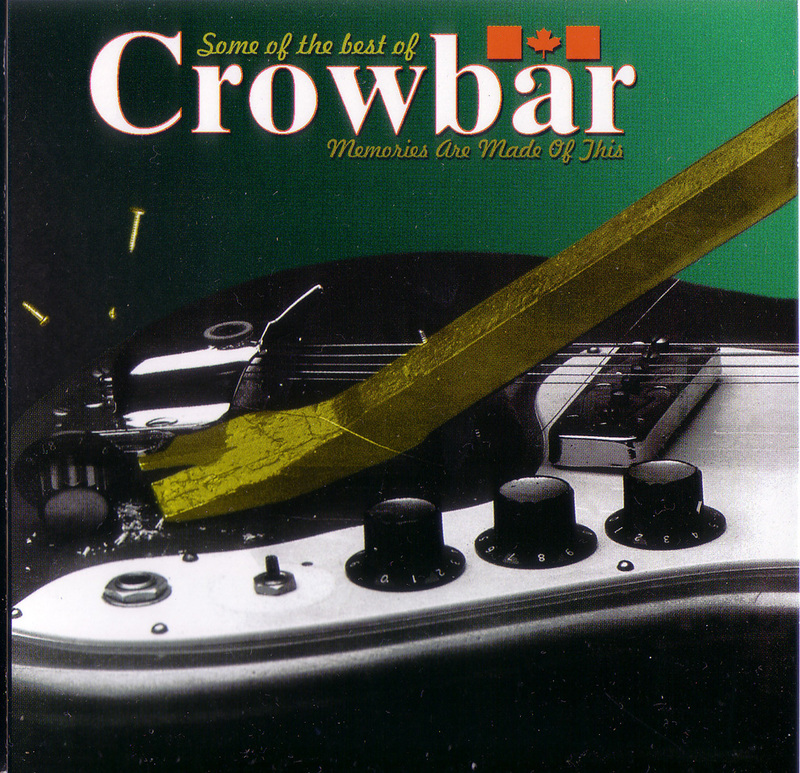 Crowbar wanted to move away from the strict blues--they were a good time rock'n'roll band. They lived in a big house on the escarpment, and prepared their first album which they named after the house, Bad Manors. It's another classic. Richard Newell went into the studio using the Crowbar musicians individually, hand-picked for their talents, hand-matched to the songs he'd selected and created the masterpiece that is Gooduns. Gooduns came packaged in a cloth bag, a flour sack, just like King Biscuit Flour from whence he derived his name. I still have that original release, I treasure it. I played that record to death, it rocked so hard I could hardly believe it was made by a Canadian. 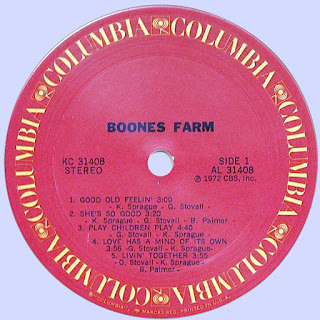 We were used to the folksongs of Gord Lightfoot, the MOR top 40 sound of the Poppy Family, but this blues this was something else. At the time, I worked in a local department store, and one Saturday I saw Richard Newell browsing in the store. I went on my break and followed him around in awe. Wow, that's KING BISCUIT BOY! Crowbar. 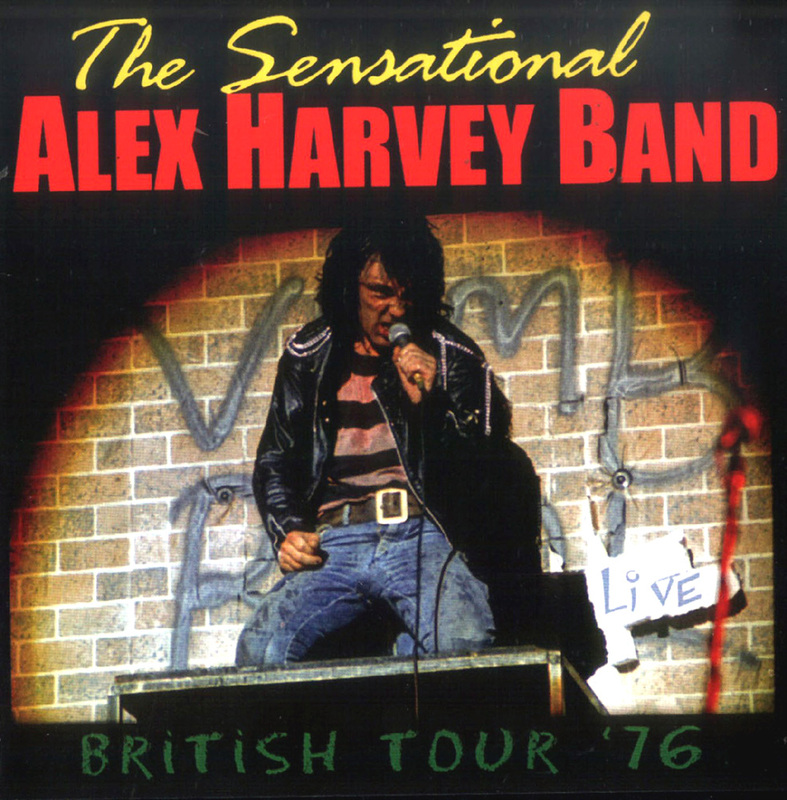 Rock band, formed in the summer of 1969 as And Many Others to accompany Ronnie Hawkins. Taking the name Crowbar, and making its base in Ancaster, near Hamilton, Ont, it left Hawkins early in 1970 after one LP and several US appearances, then backed individual members Blake 'Kelly Jay' Fordham, John Rutter and King Biscuit Boy on record. King Biscuit Boy's album Official Music and single 'Corrina, Corrina' were the most successful releases. Personnel changes left Crowbar in 1971 with 'Kelly Jay' (vocals, keyboards, harmonica), Rheal Lanthier (lead guitar), John Gibbard (slide guitar), Josef Chirowski (replacing Richard Bell, keyboards), Roly Greenaway (bass guitar) and Sonnie Bernardi (replacing Larry Atamuniuk, drums). 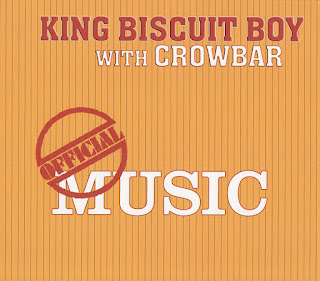 King Biscuit Boy continued as a frequent guest performer through 1971. 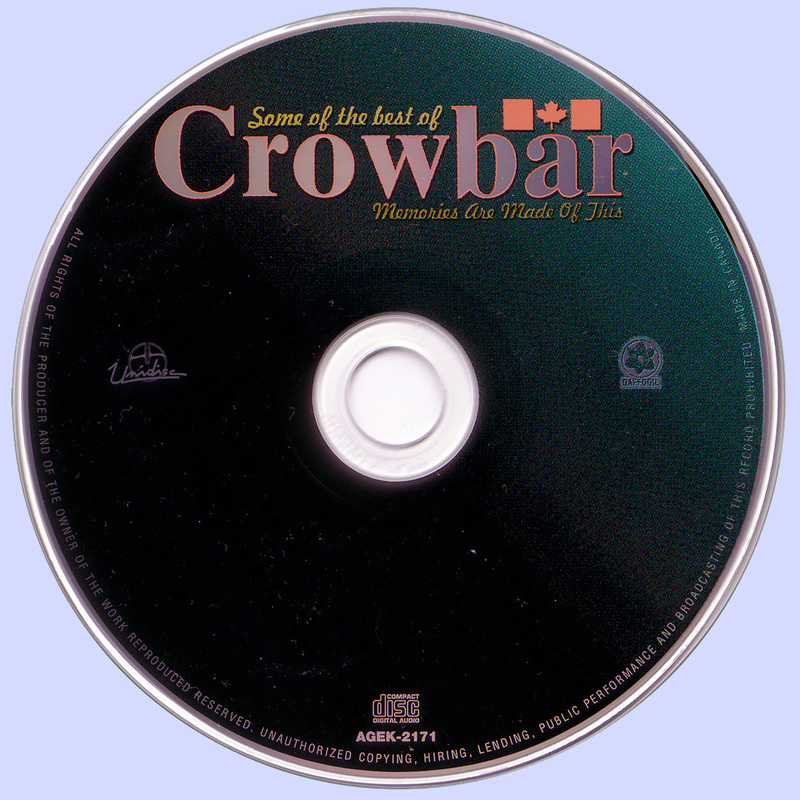 The most popular of Crowbar's singles were 'Oh What a Feeling' (1971) and 'Million Dollar Weekend' (1974). The band made three LPs 1970-2 for Daffodil - Bad Manors (SBA-16004), Larger than Life (And Liver than You'll Ever Be) (2-SBA-16007, recorded in concert at Massey Hall) and Heavy Duty (SBA-16013) - and one in 1973 for Epic, KE32746 (KE-32746). The compilation Crowbar Classics: Memories Are Made of This (SBA-16030) followed. Crowbar's rousing rock, blues and boogie made it one of Canada's most popular touring bands of the early 1970s. It appeared in Great Britain but otherwise made little impact outside of Canada, perhaps the result of the strong nationalistic fervour that characterized its performances. 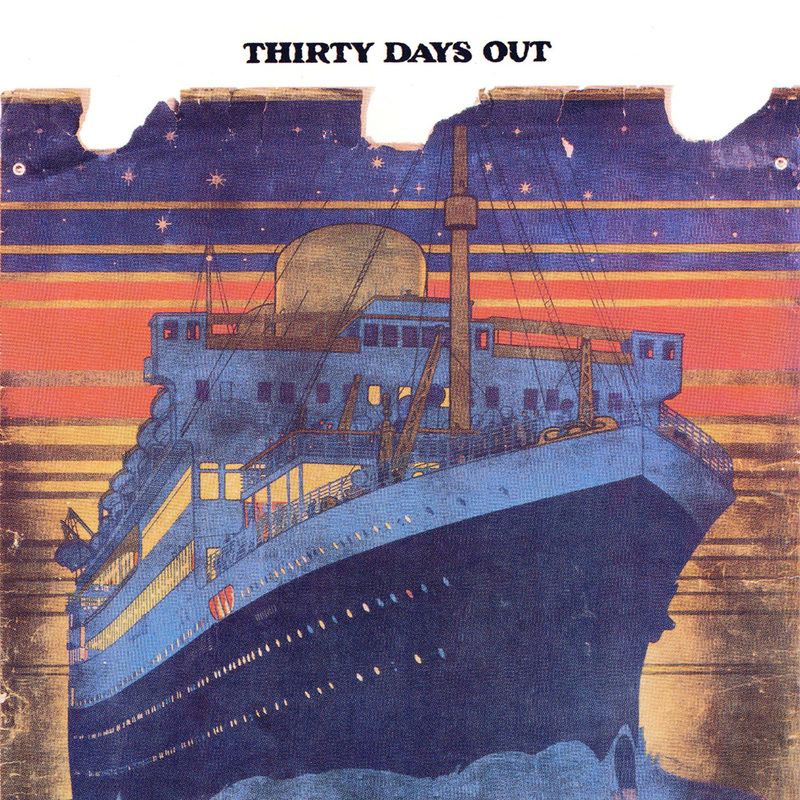 Disbanded in 1975, it was revived in 1977 for a tour of eastern Canada and again by Kelly Jay and others intermittently during the 1980s for club work in southern Ontario. Tracks 1,2,4,7,8,13 from 1970 LP "Bad mannors"
Tracks 3,11 from 1971 LP "Larger Than Life"
Tracks 5,6,9,10 from 1972 LP "Heavy Duty"